1. 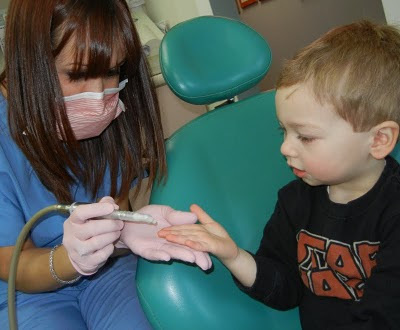 Taking the kids to my childhood pediatric dentist - being recognized by a nurse, a receptionist, and WOOHOO the dentist! 2. How awesome the nurses were at explaining everything to the kids beforehand - they both did great! 3. Jacob charming the socks off of every single person he met...he had all the ladies swooning, and was holding hands with the dentist by the time his appointment was over. 3. DID I MENTION THE BILLS?? So cool that it was YOUR childhood dentist? So what did they do? Just look at the kids teeth? Ok maybe you weren't writing it at the SAME time, now that I see the time, but pretty crazy anyhow!